Fridays tend to be rough, and this one is no different. I spend the whole day walking around a massive warehouse and studying new manufacturing techniques. I make copious notes about the complexities of laser cutting steel and welding aluminum. Then, after a long day of courting new clients in an uncomfortable environment, I’m thrilled to jump in my truck, grab dinner, and head to what I was really looking forward to all day. On the West side of Houston, not far from The Galleria is a small strip center called Briargrove. 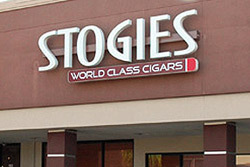 In that strip center is a 4800 sq/ft wonderful place by the name of Stogies World Class Cigars. 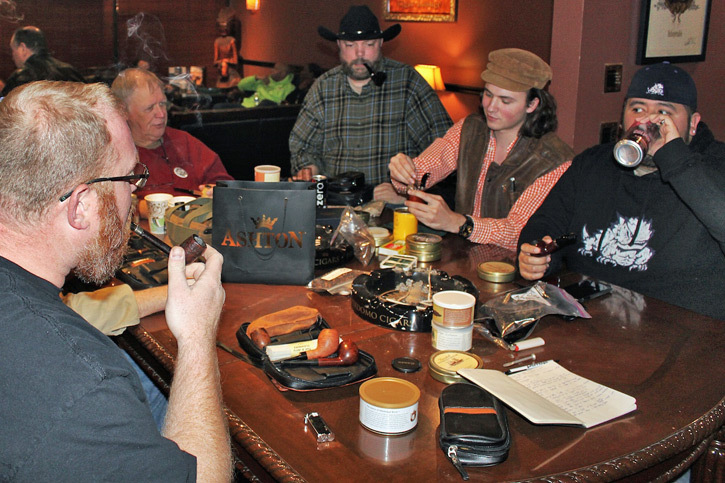 Founded in 1995, and due to double in size shortly, Stogies is the host of the Houston pipe club. I suggest to owner Jorge Ahued that it’s obvious pipes must have been his first love given that he settled in a place called Briargrove, but he insists the idea had never even occurred to him. 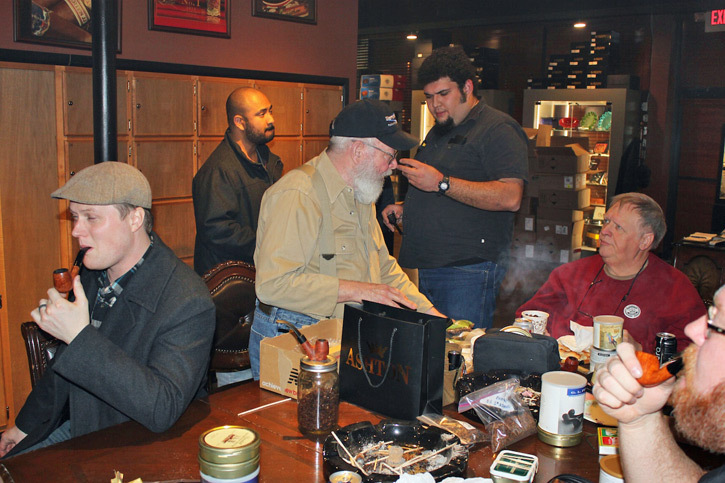 The place is full of people and well decorated with a counter-full of bulk pipe tobaccos, cases full of pipes (including a small basket of my beloved cobs), and a huge walk-in humidor filled with cigars. The lounge I’m in is open to the public, but there is another member-only lounge on the other side of a door I haven’t walked through, though I’m told it’s impressive. I walk in right at six and take a seat at the table reserved for the pipe club. I say hello to everyone while, with one eye I survey the tobaccos already available, and then I load up a bowl of two-year old Byzantium by Cornell and Diehl. After just a few pleasantries we begin to argue over how blends have changed over time as they get passed around different blending houses, new leaf becomes available, and old leaf is used up or lost. Tony Jones pulls out three tins of Hearth and Home’s Marquee series tobaccos and I make a mental note to pack a bowl of El Niño when I finish this Byzantium. People slowly pour in and the distinct smell of latakia is overpowering the smell of cigar smoke already present in the air. “Smokingpipes.com everyone, smokingpipes.com, smokingpipes.com,” Corey Kelley says over and over again to honor the sponsor for tonight’s event. They sent out a Savinelli pipe and a number of tobaccos to pass out. Corey, the official leader of the group, stands up with a bag full of these tobaccos and walks around the room letting people pick from the bag. I haven’t had Dunhill’s Elizabethan Mixture in over a year so I decide to try that again. “I brought a 35 year old tin of that a few months back, and no one even opened it,” Tony says. I lament not being present that evening. I also try not to judge anyone for passing up such an opportunity. I’m always curious about what everyone does for a living, and one of the younger guys, Austin Schwarz, spends some time telling me about his experience in India back when he was still in College. While he talks, he shows us a pipe he brought that has a fancy wind cap. I hold it and comment on how heavy it is—then I spend a minute thinking about how pipes are much more forgiving than people, we can say anything we want about their weight and they’re never offended. I try not to laugh at my “pipes are better than people” thoughts and I pack a bowl of El Niño. Someone makes a Chris Farley joke. Tony hands me a small but beautiful Poul Ilstead Bulldog and Corey takes out a pipe he recently made. Mike Butera is a regular attendee of the event but didn’t make it out tonight. While Butera hasn’t exactly been mentoring Corey, he does offer him advice on occasion, and Corey certainly doesn’t complain about having a resource like him available to talk with each month. I ask Corey what kinds of things an experienced pipe maker comments on and he says Butera asks questions real politely about why his stem and mortise don’t meet perfectly in certain places, or why the bowl is shaped a certain way. Small flaws I might never notice in pipe construction but are immediately obvious to someone who has been doing it forever. Not everyone has a resource like Butera available once a month at a social event. 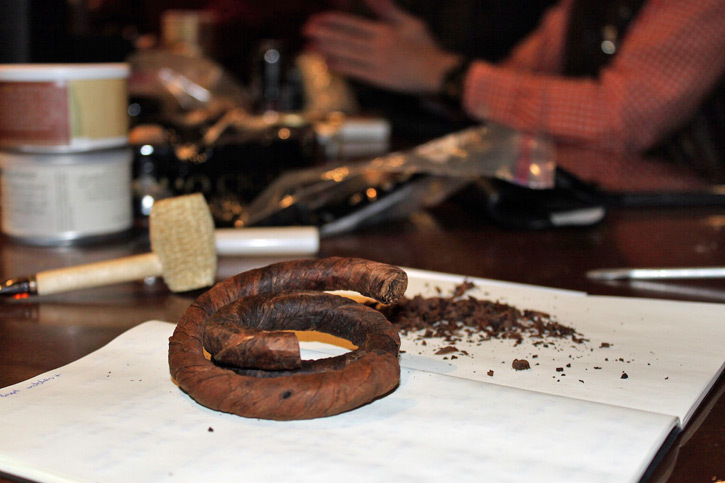 Having a whole group of people to talk with who care about the size of a draft hole, the shape of a bit, and the grain on a bowl is just one of the many benefits of attending a pipe club. When I begin to review tobaccos for my wife, she only sometimes makes it through the first few words before she stops me because she just doesn’t know how to care. These guys know how to genuinely be interested in what I’ve been smoking, they have opinions of their own they’re interested in sharing, and they have suggestions for other things I should try. And since they live in the same urban area (and I use that term loosely), they have opinions about the local brick and mortar shops and even their parking situations. I also love gathering in crowds with other pipe smokers so I can mooch off their tobacco. I like to try new blends, as I easily get stuck in a rut. Often I’ve read about something and I’m curious to try it myself but fairly convinced I won’t like it enough to warrant buying a whole tin. There are lots of genre’s of tobacco I appreciate even though I almost never smoke them. 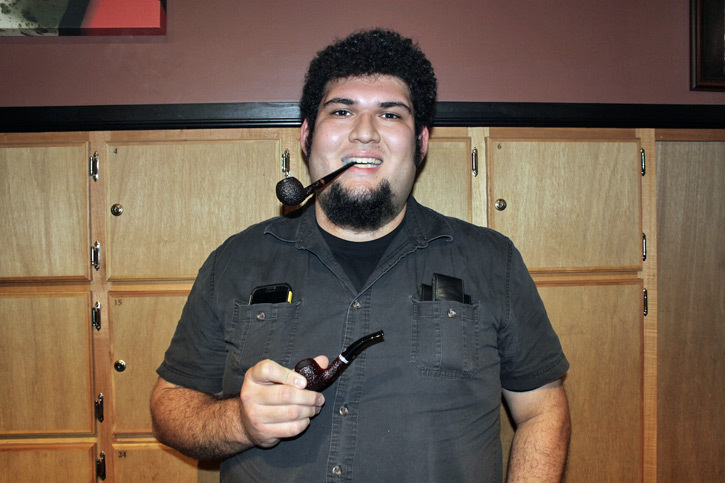 Speaking of mooching, Joseph Melancon, who drives about two hours down from College Station where he attends Texas A&M University, walks in and pulls out some interesting tobaccos. Among them he has a string of Gawith and Hoggarth’s Brown “Happy” Bogie Rope. I’ve always been interested in rope tobacco, but read such mixed reviews I have been hesitant to buy any myself—especially when there are so many other things I’m interested in. I express an inordinate amount of interest and, after he offers, I cut off several coins of the rope (which is much skinnier in real life than it appears on the internet) and pack my pipe. Just lighting up causes my eyes to water slightly, and I have to take two breaks due to the nicotine hit during the first fifteen minutes of the bowl. It does, however, slowly grow on me, enough so that I determine to order a couple of ounces after that initial smoke. Corey get’s everyone’s attention and begins a raffle, first of the Savinelli pipe, and then of the tobaccos SmokingPipes.com donated for the evening. Joseph wins the pipe. I win an 8oz tin of G.L. Pease Quiet Nights. At first I’m hesitant to take it because there are so few latakia blends I regularly smoke, but after trying it I’m convinced it will make it’s way in to my rotation without any problems. Right after the raffle, and already somewhat late in to the evening, four more guys trickle through the doors. It’s always good to have more company, but secretly I’m glad they missed the raffle and thereby increased my chances. And apparently a selfish tobacco hoarder. One of these new guys has never smoked a pipe before and is initially nervous to share this information. But we’re excited he’s here and interested in watching him try something other than the cigars with which he’s familiar. After giving him a smell from tins of burley, virginia, latakia, and cavendish tobaccos (to give him a feeling of what’s out there), the table consensus is that he should start with Carter Hall. He does this, unsure if he packed his pipe correctly, but then he lights up, and quickly finds he’s a fan. Albert Jones, the club’s unofficial aromatic evangelist (every group needs at least one), donates a pouch of Carter Hall to him so he can take something home. As the evening wears on we discuss everything from the smart watches people are wearing to facial hair. There are least two people at the table wholly incapable of growing facial hair, and this definitely becomes a point of tension. We look at pipe bags, complain about our jobs, our bosses, and generally have quality conversation about mostly useless topics. I ask Corey for some details about the pipe club. He tells me Mike Butera and a few of his friends had been meeting unofficially for several years. I ask him about how he became president and he says, “It’s more of a dictatorship really, there were no elections. I just bought the domain and starting sending out newsletters and updates. Actually, I prefer the term supreme leader.” So there you go, North Korea and the Houston Pipe Club. 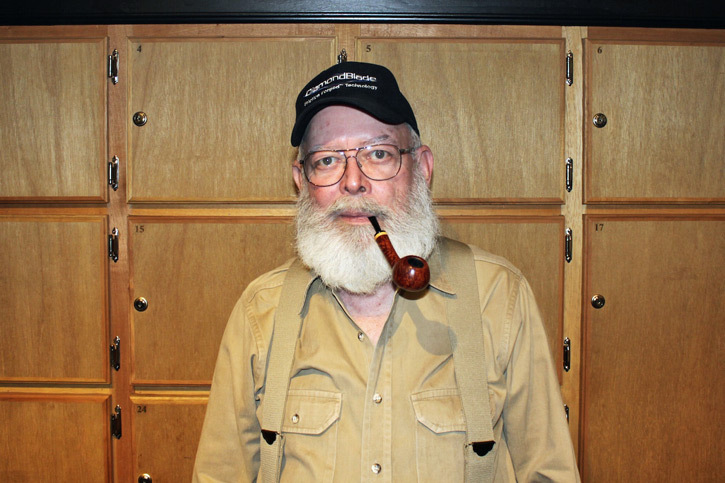 Now the club is a due-paying member of the United Pipe Clubs of America and Mark Tinsky is working on a club pipe. The plan is for a stacked billiard to bear the club name. 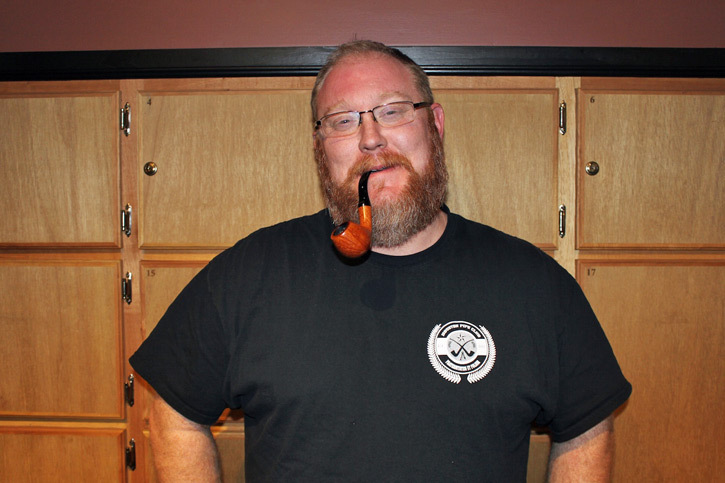 Corey’s dream is for a few quality tobaccos and a well made pipe with the name “Houston Pipe Club” to be well known amongst pipe smokers everywhere. He’s making good progress towards that goal. The club has grown since 2012 when it went from an unofficial gathering to an official club and it sees regular attendance in the 20s or so. The mailing list is growing and now has over 50 subscribers. New people are regularly showing up saying they heard about the club through Google or Reddit. There is a calm predictability of finding a big group of people with whom I have one very important thing in common. My night draws to a close with a few more bowls and I prepare for my long ride home. The Houston club may be more diverse than many clubs throughout the states, seeing people from many different countries come through, but that is just representative of the demographics of the city as a whole. Other than this, the evening lacks anything particularly remarkable, other than an evening filled with pipes, glorious tobaccos, and the guys who love and smoke them. People lean on one another and live life in community.